Kiwi fruit food pictures, photos & images. The kiwifruit, often shortened to kiwi in many parts of the world, is the edible berry of a cultivar group of the woody vine Actinidia deliciosa and hybrids between this and other species in the genus Actinidia. Also known as the Chinese gooseberry, the fruit was renamed for export marketing reasons in the 1950s; briefly to melonette, and then later by New Zealand exporters to kiwifruit. 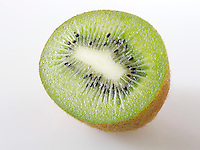 This name "kiwifruit" comes from the kiwi — a brown flightless bird and New Zealand's national symbol, and also a colloquial name for the New Zealand people. 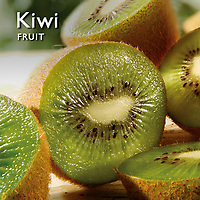 Kiwifruit is a rich source of vitamin C, 1.5 times the DRI scale in the US. Its potassium content by weight is slightly less than that of a banana. It also contains vitamin E, and a small amount of vitamin A. The skin is a good source of flavonoid antioxidants. The kiwifruit seed oil contains on average 62% alpha-linolenic acid, an omega-3 fatty acid.